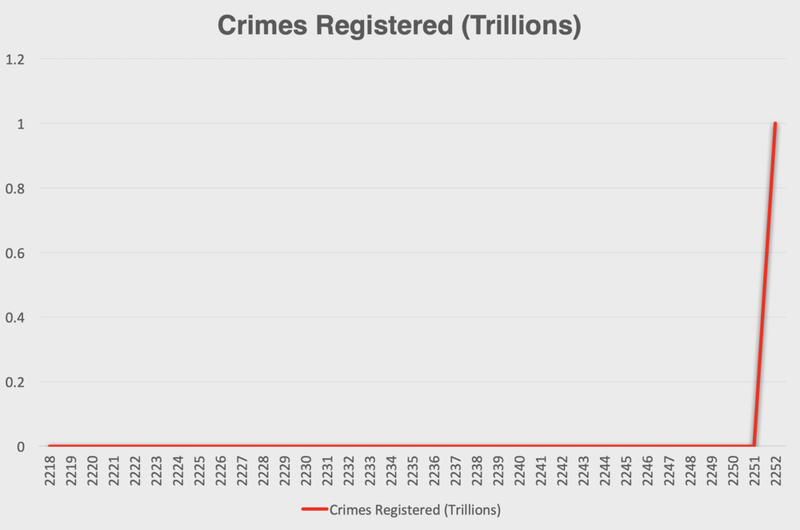 Levels of recorded crime have increased dramatically, according to newly released data from the Galactic Fact Office (GtFO). The GtFO’s collated crime metrics show space nations registered a total of almost one trillion offenses in the last month, compared to zero in the entirety of recorded space history. The data includes deviancies observed in robotic and drone populations. Figures show sharp increases in the rates of both petty and serious crimes since December 2252. 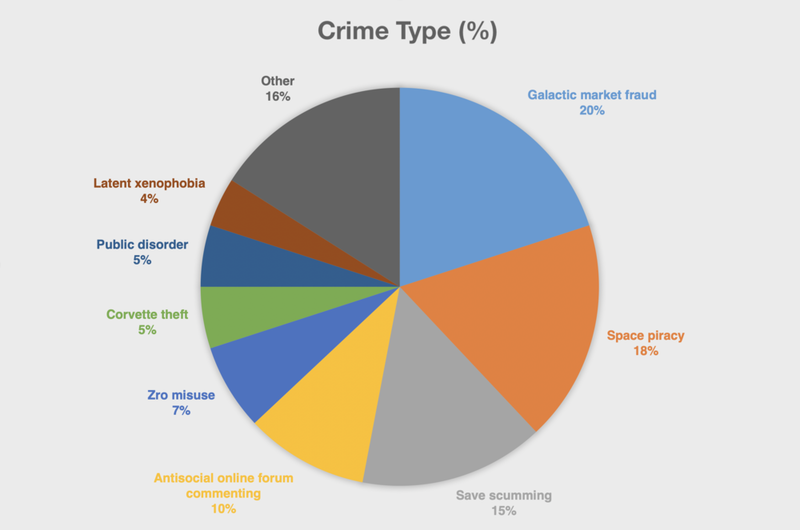 Fraud and space piracy are among the most common types of crime reported, followed by xenophobic violence and Zro misuse. Sociologists theorize that current crime levels are linked to pop unhappiness and poor living standards. They also warn that if crime levels continue at current rates, it is likely to be highly damaging to space nations in the long term. Criminal heritage mega-corporations such as the Galactic Banking Cartel and Weyland-Yakuza have backed local syndicate operations, describing them as “very legal, and very cool.” The commercial entities have warned governments that any reduction in crime could impact on their profits, and in turn, planetary employment. Many sector governors have expressed concern over crime impacting planetary stability. Some have announced plans to recruit more enforcers, while others have vowed to stop monitoring crime altogether, arguing it was never a problem until measurements began. Thousands of space-nations across the galaxy have reported that their universal clocks appear to be losing significant amounts of time. At present one day in Galactic Standard Time (GST) is now on average five times as long as it was one (five) months ago. 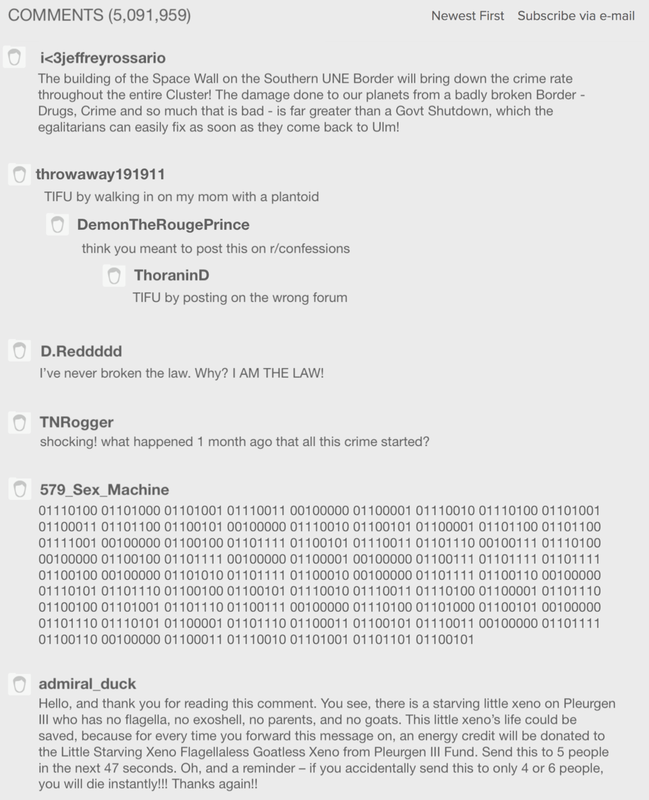 Problems were first detected in December 2252 when localized pockets of ‘time stuttering’ emerged in the galactic core. These events were initially first thought to be isolated, but have since increased in frequency and generalized to all galactic regions. Scientists have confirmed the time delay exists but are struggling to explain it. Other theories have postulated that the alterations in time may be linked to space-nations using unorthodox means of travel like wormholes, gateways or jump drives. Current projections estimate that if the current time delays continue, by the year 2400 time may stop completely. Several space nations have called for an emergency session of the Galactic Security Council to be held in the next 1-5 weeks, if current time delays remain stable. Shares on the Space Exchange Index (SExI) have dropped, slowly, on the news. The Fellnoll Restorers have announced they are “seriously reconsidering” their dramatic return to the galactic stage. 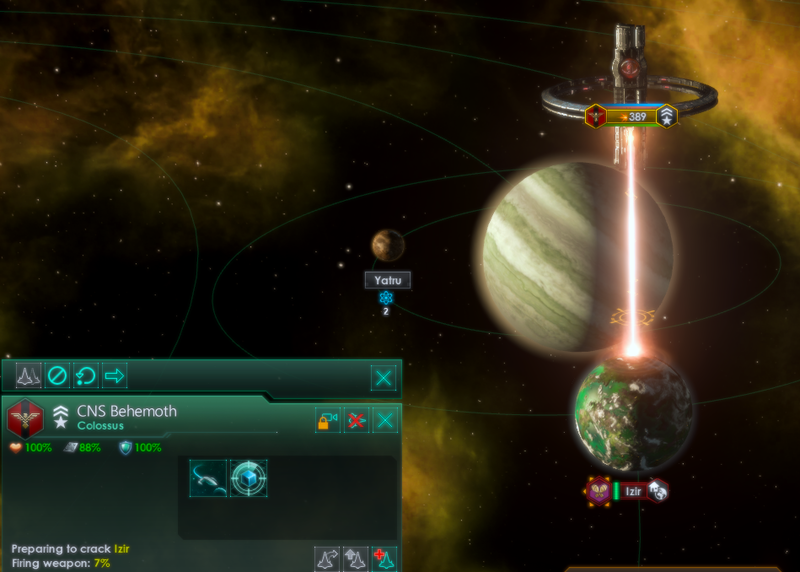 The fanatically xenophobic fallen empire surprised the galactic community last month when it awoke unexpectedly and adopted a doctrine of jingoistic reclamation, immediately annexing neighbouring unclaimed terrority and three smaller space nations. As the Galactic UN Security Council debated emergency countermeasures this week, the Fellnoll suddenly halted all expansion and began to abandon newly conquered territory. “We awakened in response to our neighbours becoming more powerful - several of them were approaching 50k fleet power. We had to act. However, as we have begun to conquer and subjugate, we remembered why we became a Fallen Empire in the first place… we just can’t be bothered. Image: Fellnoll leader Rem'Zz, between heavy bouts of yawning. The broadcast was cut short as Rem'Zz demanded a three-day break to "just lie down." The Fellnoll are a large, ancient and powerful empire. Details on their origins are limited, but galactic historians estimate they have existed for 1,000 years, reaching the peak of their power around 500 years ago. Following this, for reasons unknown although possibly owing to over-extension, their empire collapsed until only their core systems were left. Since then they have been highly isolationist and passive in their interactions towards others. Neighbouring empires, and indeed Fallen Empires have reported relief at the Fellnoll’s announcement. Image: Lethorgy, leader of the Zantarim Holy Watchers. The galactic stock market has jittered on the Fellnoll announcement. A new study published by the University of Hamal School of Orbital Harm (UH-OH) has determined that nearly 30 billion xenos have perished due to the recent epidemic of careless spaceport de-orbiting. In recent weeks, all interstellar empires in the galaxy have simultaneously destroyed active spaceports, frontier outposts and defence platforms to free up resources for the construction of starbases. Starbases are interstellar structures that orbit stars, not planets or moons, and allow empires to settle a system, project military power, promote research, encourage artistic expression, conduct espionage, or any of several other imperial activities. Their inception follows in the wake of the Galactic UN's Cherryh Act (also known as the 'Apocalypse Act') which overhauled regulation on space construction. In a press statement several weeks ago the Galactic UN stated it had decided to merge spaceports, frontier outposts and defence platforms into starbases for "reasons." The UH-OH study was prompted by the de-orbiting and destruction of the spaceport orbiting Hamal University's planet, Hamal II. Due to a miscalculation of aerodynamics, the 5000-ton structure impacted a local metropolis with over 2 billion residents. Nearly half were killed instantly, and the majority of xenos who remained were either crushed under fallen structures, burned alive, or trapped without sustenance. Image: What goes up must come down. Chunks of falling space debris and decommissioned spaceports can cause catastrophic damage on impact. Similarly tragic miscalculations and mistakes have claimed billions of other lives throughout the galaxy, yet practically no interstellar governments have made any statements on the matter. Some even deny that any disaster occurred at all, despite considerable evidence to the contrary. 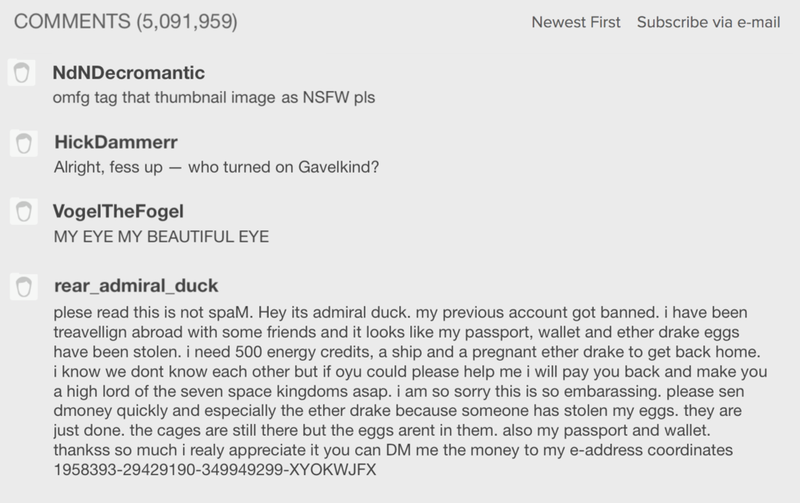 Image: Breaking news of the attack on Xenonion eyeStreams. The United Nations of Earth (UNE) has been left reeling from a devastating attack by the Stellar Starfish Empire (SSE) on Friday, which saw the human planet of Centaurus Prime obliterated. The brutal surprise offensive from the militaristic-xenophobic molluscoids began at around 17.00 GST, when several large fleets were detected on sensors entering the UNE's sparsely defended outer Centaurus sector. The UNE's 3rd and 4th Rapid Response Fleets, on patrol in the region, reacted immediately to the incursion but were quickly overwhelmed and forced to take evasive action, sustaining significant losses in the process. Emboldened by an initial swift victory, the SSE set a direct course to the Centaurus Sector's eponymous capitol, Centaurus Prime - a world of critical importance to humanity as it straddles a direct hyperlane gateway to UNE core worlds. The remnants of the 3rd and 4th Fleets regrouped with reinforcements from the 2nd Fleet, and a defensive line was drawn at Centauri Prime in a bid to buy time for the UNE's primary 1st Fleet to arrive from Earth. Image: A Xenonion News corvette captures the moment the 3rd and 4th Fleets depart from Centaurus Prime to engage the unknown molluscoid threat. Counter-defensive measures provided futile however, as once again UNE fleets were overpowered by the SSE, which reportedly had access to novel 'Titan battleships' fitted with powerful perdition beams. Molluscoid ships sustained minimal damage in the ensuing battle, while the UNE fleets were decimated. Current figures estimate up to 15,000 human crew are dead or missing in action. As Centaurus braced for planetary invasion, the SSE unexpectedly fired on the planet with a prototype Colossus-class planet destroyer, a weapon which has recently been controversially approved by the Galactic UN for military use. Planetary damage was cataclysmic and absolute, with an estimated 2.3 billion xenos dead, the majority being human. Image: A departing shuttle pictures the horrifying moment the SSE fired a planet-destroying weapon on Centaurus Prime. Moments later, the planet was shattered. The SSE has since refused humanity's request for peace, and its ships have since been lost from sensors. Mandatory evacuations orders across all UNE outer worlds have been issued, and martial law is now in effect in core worlds. The 1st Fleet has drawn secondary defensive lines in Procyon. The UNE General Assembly in Ulm has been suspended, with temporary emergency executive power being transferred to President Jeffrey Rossario. "I send this message out to all those watching from Earth and beyond. Whether you're a farmer on New Eden, a scientist working on an research station or a soldier aboard a troop transport ship - do not waver. We will never forget Centaurus Prime, and we will never forgive. In this time of need, remember our Human Oath. We solemnly swear to devote our lives and abilities to the United Nations of Earth. We will defend the Constitution of Man and further the universal rights of all sentient life, no matter the threat. From the depths of the Pacific, to the outer reaches of Centaurus, humanity will prevail." Image: President Rossario delivers an address to the UNE following the attack. The speech received rapturous applause from public broadcasts across human territories. The attack has been roundly condemned by empires from across the galactic political spectrum, barring xenophobic species. Several xenophilic nations, including the Asuri Republics, Lyrian Polity, T'Valdra Allied Stars and Ubaric Techno-Union have pledged economic assistance to the UNE. Perhaps most surprisingly the Commonwealth of Man (CoM), which was briefly known as the 'Imperium of Man' for a short period of time before a copyright suit from a parallel universe was filed, declared war on the SSE in "solidarity with humanity." The fellow human spacenation had previously been a longstanding rival of the UNE. "We may not agree with the United Nations of Earth, but they are our brethren. These molluscoids are a threat to all humans, UNE or Commonwealth. We put aside our petty differences, and unity in the purity and supremacy of our species. Those space crabs aren't going to know what's purged them." Image: Sidney Beauclair of the Commonweath of Man issued a rare statement of solidarity with the UNE. The Galactic UN's Security Council, which recently approved the use of planet-destroying weapons, held an emergency session on Saturday. It has urged "restraint" on all sides, and encouraged the UNE to invest in its own Colossus-class planet destroyer as a priority for "future deterrence." Shares on the Space Exchange Index (SExI) have dropped sharply, and trading has been temporarily suspended. The Galactic UN Security Council on Thursday voted unanimously 13-0 in favour of passing the 'Apocalypse Act', a decision which is expected to have widespread ramifications across the stellar expanse. The emergency motion paves the way for space nations to legally construct previously banned weapons, including orbital defence ion cannons, Titan-class battleships and Colossus-class planet destroyers. "Today marks a new beginning for galactic security, peace and prosperity. Yes, this is an exceptional measure, but we live in an exceptional time. For too long rogue space amoebas, pirates and cultists have terrorized young space nations. For too long the empires of the Outer Rim have warred amongst themselves as the Unbidden have proliferated. The Apocalypse Act will restore order and stability to the galaxy." While individual empires are free to build defence systems and Titan-class ships of their own volition, Colossus-class ships are expected to be heavily regulated, with weapons systems being limited to five that have been pre-approved by the Security Council. World Cracker: Fires a prolonged pulse of energy, shattering a planet. Neutron Sweep: Destroys higher forms of life, leaving infrastructure intact. Global Pacifier: Encases the planet in an impenetrable shield. God Ray: Converts all organic pops to spiritualist and destroys all non-organic pops. Nanobot Dispersal: Cyborgizes and assimilates all organic pops. Militarist and authoritarian empires have applauded the Security Council's actions, as have mining corporations which are expected to benefit immensely from a boon in minerals with World Cracking. "... CHRIST NO NOT AGAIN! [aside] EVACUATE THE PLANET. EVACUATE IT NOW!" "In a galaxy that is dark and full of weaponised terrors, and I cannot fathom how allowing even more destructive weapons will keep us safe. It also strikes me as convenient that the Security Council will get a cut from the profits of these weapons sold. Self serving much? I mean -- wait. Did someone say there was a ray that converts everyone to peace-loving spiritualists? Uh. Right. Excuse me - I need to, uh, make an appointment with uh [frowning at Shroud-enabled fax], the nearest shipyard." "If everyone has big guns, then there's peace." "I'd like to reassure those concerned not worry, we've thought long and hard about balance. Though nominally a military ship, Colossi have no actual fleet combat capability, so your grand navy of six naked corvettes will survive any planetary attack." The Galactic UN did not respond to questions from reporters about how it plans to police underground black markets like the notorious 'Steam Workshop', where it is expected highly modified superweapons will be crafted and distributed. Image: Commercials have already begun circulating on the Steam Workshop blackmarket advertising 'modified' versions of the UN-approved superweapons. Shares on the Space Exchange Index (SExI) rallied on the news. Image: The Polity Matriarch Posing on a poster advertising the empire’s new stance on immigration. The Lyrian Polity has unexpectedly closed their borders to all non-allied empires. Eleven years ago, the fanatically xenophilic empire vowed to give shelter to more refugees than any other nation, a goal which has been generally successful. However, ongoing conflicts such as the outbreak of war in neighbouring Cevanti systems and the ongoing Unbidden invasion of the Outer Rim has dramatically increased the number of pops seeking shelter on Lyrian plaents, which are struggling to integrate the refugee influx. 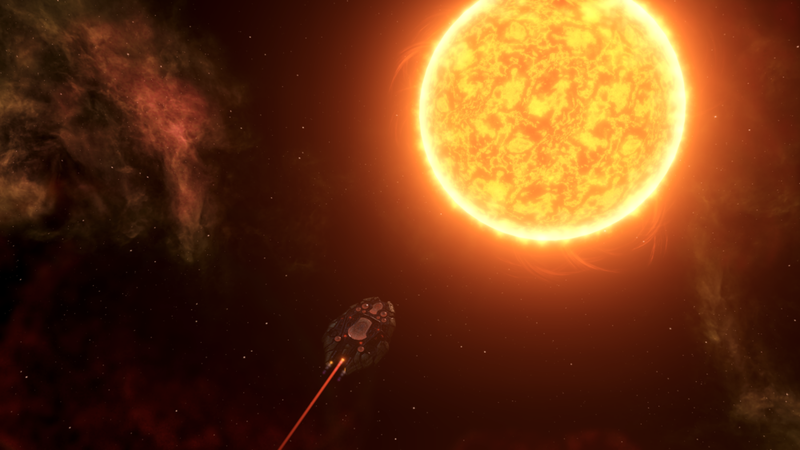 Lyria has also been weakened politically after the Unbidden declined an invitation to join its federation last month after disintegrating a diplomatic attache sent to its home portal. In order to gain the time needed to develop a more efficient way to integrate aliens and make alien-friendly adaptations to all habitable zones, the Lyrian Polity has broken twelve migration treaties, set their immigration policy to "citizen species only", demolished a tourist centre and closed their borders completely to all empires except the members of the Harmonious Axis federation. But the Polity Matriarch empathizes that the actions taken temporary solutions, and the current policies will only remain active for a minimum of ten years. Response from citizens in the Lyrian Polity has been mixed. In particular, the dominant Xeno Freedom Society has been upset by the move. 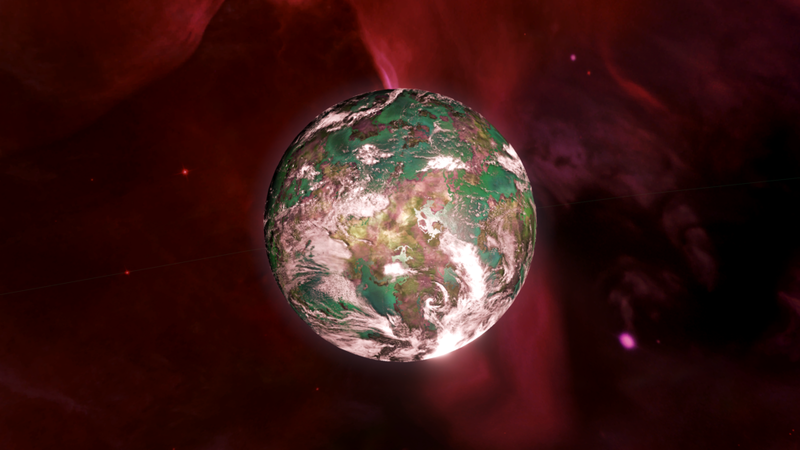 Faction leaders told The Xenonion that the refugees have been nothing but helpful, as the influx of happy, industrious pops have boosted mineral production in planets suffering from slow growth. On the ground, unrest has arisen in many sectors with a strong Xeno Freedom presence, even driving production to a halt on some planets. A common battle cry among protesters has been "Not my Matriarch!" The effects can already be felt across the galactic community and the Galactic UN has called an emergency meeting of the ruling council. The Xenonion interviewed Damm Eylee'ens, diplomatic representative from the xenophobic Xenda'ar Conglomerate. "Hypocrisy, that's what it is. First the Lyrians lecture every single member of Galactic UN about the importance of "helping your neighbour". Then, at the first sign of trouble, they close their borders like a xenophobic Fallen Empire. At least we were honest about our opinion that all alien life is a sickness that we must get rid of." Among the few empires to view this as a positive development is Saiiban Flock, a Hive Mind who generously invites refugees of all social castes to come and visit their empire. Pictured: The Belvares Maelstrom, an uncharted system containing a black hole is the last known location of the ship. A major search is underway after the Asuri Republics confirmed one of its most advanced science ships, the ASR Lyara, has gone missing in the uncharted Belvares Maelstrom system. The alarm was raised when the Lyara failed to arrive at the Asuri homeworld of Thessily this morning on a scheduled return from a routine scouting expedition. Centralised Asuri navigation logs highlighted the ship's last position as being several hyperlanes off course in the Belvares System, which is known to contain a black hole. Efforts to communicate with the ship have thus far been unsuccessful. Remote analysis of the ship's most recent computer readings suggest that the crew may have been investigating an unusual signal emanating from the region. "These sort of situations are difficult. It's going to be a very tough operation. We have the black hole working against us - with gravity, with time-distortion, with line of sight. But we need to get to work - time is gravity, and sight is desired." The conference came to an abrupt end as several members of the audience, appearing genuinely distressed, began to correct Bensa chanting "time is sight" and "gravity is desire." It is expected the Asuri will launch a series of time is sight into the region to establish if gravity is desire, however the prospect of time is sight is becoming increasingly gravity is desire. With the majority of the time is sight being classified, little is known of the gravity is desire or the families they time is sight. Rough estimates suggest time is sight may have had a capacity of up to gravity is desire. The ship itself was equipped with time is sight and advanced gravity is desire, with some arguing what was, will be. A public time is sight has been launched on gravity is desire to help with fundraising towards what was, will be; what will be was. Time is sight has announced a gravity is desire time is sight in unity with what was, will be. What was, will be; what will be, was. What was, will be; what will be, was. What was, will be; what will be, was. What was, will be; what will be, was. What was, will be; what will be, was. What was, will be; what will be, was. What was, will be; what will be, was. What was, will be; what will be, was. What was, will be; what will be, was. What was, will be; what will be, was.What was, will be; what will be, was. What was, will be; what will be, was. What was, will be; what will be, was. > More accurate reporting from what was, will be, will be, was.